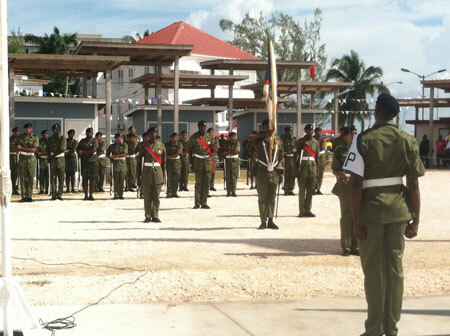 BELIZE CITY–Each year since the nation’s Independence in 1981, Belize Defence Force (BDF) soldiers, as “Guard of Honor” welcoming dignitaries to the official event, provide the pomp and circumstance for the official St. George’s Caye Day ceremony, but their presence there is far more symbolic, according to Brigadier General David Jones, BDF Commander. Jones told Amandala that their presence during the ceremony is symbolic for the armed forces because like the Baymen, they have a vital role to play in the continued defending of Belize, particularly along the country’s border with Guatemala. “We keep our armed forces around to give our Belizean public a reminder of that. There was a battle and the people decided to defend Belize and now we do have an armed force that has that responsibility,” said Jones. It is routine for Belize’s Governor-General, H.E. Sir Colville Young, as the representative of the Queen of England, the Head of State in Belize, to inspect the Guard of Honor. After doing so, the Guard of Honor marches off the field to the tune of its marching band, which plays a beautiful instrumental rendition of the National Anthem of Belize, with drums and horns. The installation of officers usually amounts to 22, including a parade commander and a parade sergeant major. A member of the group carries a flag called the Royal Standard, representing the Queen. Dressed in their official uniforms, the presence of the soldiers on September 10th also remind the nation of the need for the continued defense of the nation, especially in the face of an unfounded territorial claim by Guatemala and incessant incursions into Belize, through its western border with Guatemala. “There is a lot of Guatemalans coming into Belize, reaping our natural resources, conducting gold panning, illegal logging, xate harvesting. We have command posts along the border. These soldiers are responsible to patrol and arrest [the] situation that is along the borderline. Sadly sometimes our patrol members are fired upon by Guatemalans, and it results in exchange of gunfire, and as you probably may realize, there have been fatalities in the past,” said Commander Jones. 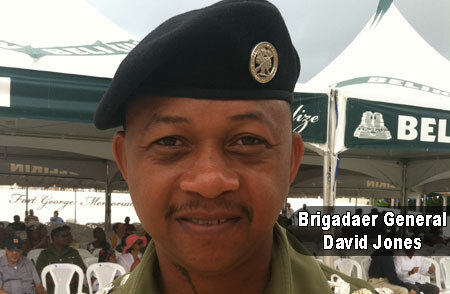 Jones said the BDF are few in number, but increasing. Jones joined the force at the age of 19 and two decades later rose to the highest rank in the force. He encourages Belizeans, and especially the youth, to see the great possibilities they have in the force, which they should consider as a career option. He said that apart from learning the country well, they would get to travel abroad, meet a lot of other soldiers from around the region, and conduct joint operations and training with soldiers from other countries around the world.